In the development of future molecular devices, new display technologies, and "artificial muscles" in nanoelectromechanical devices, functional molecules are likely to play a primary role. Rotaxanes, one family of such molecules, are tiny, mechanically interlocked structures that consist of a dumbell-shaped molecule whose rod section is encircled by a ring. 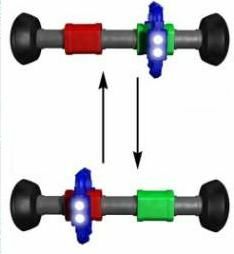 These structures behave as molecular "machines," with the ring moving along the rod from one station to another when stimulated by a chemical reaction, light or acidity. To realize the potential of these molecular machines, however, it is necessary to understand and to measure their function at the nanoscale. Previous methods for observing their operation have involved chemical measurements in solution and studying collections of them attached to surfaces, but neither has provided an accurate picture of their function in environments that are relevant to molecular-device operation. Now, a multidisciplinary team of researchers from UCLA, Northwestern University, UC Merced, Pennsylvania State University and Japan has succeeded in observing single-molecule interactions of bistable rotaxanes functioning in their native environment. The team's findings are published in the current edition of the journal ACS Nano. Led by Paul Weiss from UCLA and Fraser Stoddart from Northwestern University, the team developed a molecular design that firmly attached rotaxanes to a surface, enabling them to be individually examined in their native environment by a scanning tunneling microscope (STM). Using this technology, the researchers were able to record station changes by the rotaxanes' rings along their rods in response to electrochemical signals. Previously, rotaxanes had to be grouped for study because of their mobility and flexibility when attached to surfaces. And because STM instruments utilize an atomically thin tip to feel out nanoscale surfaces ― in much the same way a blind person reads Braille ― the rotaxanes' flexible nature made it difficult to study them individually. The research team's molecular design, however, helped significantly reduce this flexibility. The STM developed by the team enables much more detailed studies of molecular machines, leading to greater understanding of how they interact with their neighbors and how they might work together in nanoelectromechanical devices. Paul Weiss, distinguished professor of chemistry and biochemistry, holds UCLA's Fred Kavli Chair in Nanosystems Sciences and is director of the California NanoSystems Institute (CNSI) at UCLA. Fraser Stoddart is the Board of Trustees Professor of Chemistry and director of the Center for the Chemistry of Integrated Systems (CCIS) at Northwestern University. The work was funded by the National Science Foundation, the Semiconductor Research Corporation and the Kavli Foundation.